« The art market of today sends very mixed messages. On the one hand, we continue to sell the most expensive, rarest and most important artworks. 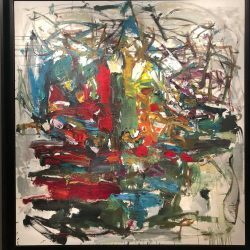 On the other hand, the paintings that are not so very rare, the works that trade at around 100 00 euros despite being made by famous artists like Lucio Fontana, often encounter increasingly lower demand. » Michele Casamonti, founder of the Tornabuoni gallery based in London, Paris and Florence among other places, is one of the 291 participants in the leading global fair of 20th and 21st-century art, Art Basel. It is opening, therefore, in a challenging business environment. 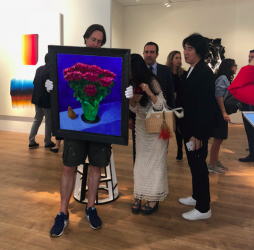 “The market is becoming a two-tier one, with astronomical sums being obtained by auction houses, which receive ample media coverage, at the same time as business is becoming increasingly difficult for the medium-sized and younger galleries. Demand for contemporary art is greater than ever, but it is expressing relatively conservative tastes”. By conservative Marc Spiegler means reassuring. This year’s fair, which is of a particularly high quality, is above all offering what we call “safe” investments. 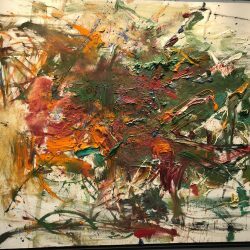 Never have so many abstract paintings by long-underrated big names been seen at a fair, like the American artist who spent a lot of time in France, Joan Mitchell (1925-1992). From the very first day the Hauser & Wirth and Lévy Gorvy galleries both sold canvases by the artist for 14 and nearly 15 million dollars respectively. 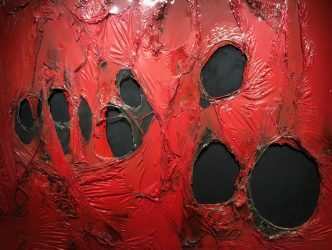 Tornabuoni’s entire booth is dedicated to an Italian artist, Alberto Burri (1915-1995), who is little known to the wider public but celebrated by contemporary art historians. He was the subject of a retrospective that occupied nearly the whole of the Guggenheim in New York in 2015. 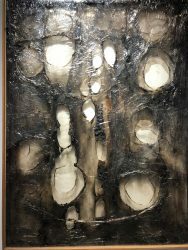 The 10 Burri pieces at this booth constitute a body of work that takes burnt plastic as material made between 1957 and ’64, on sale for between 5 and 15 million euros. The Michael Werner gallery is famed for the quality of its figurative paintings. 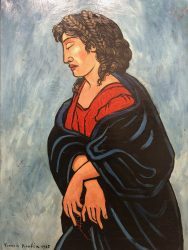 For many years now it has exhibited alongside the leading lights of contemporary painting like Peter Doig, the Dadaist, surrealist and subversive painter Francis Picabia (1879-1953). 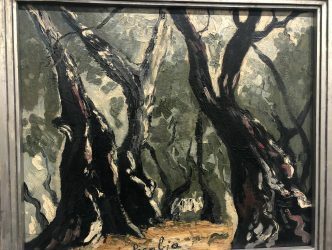 One of his surprising artworks, a landscape in a seemingly classical style made in 1938, was sold at the opening of the fair for 400,000 dollars. His partner, Gordon Veneklasen, gives his diagnosis of the current state of the market. Among the array of galleries presenting artists who are younger but have achieved international renown, there’s Eva Presenhuber from Zurich who also opened a gallery in New York in May 2017. One of her star artists is Joe Bradley (born in 1975), a multifaceted American abstract painter whose prices climbed from 250,000 dollars to 850,000 dollars around two years ago, when he began presenting his work in conjunction with the Gagosian gallery. Today, his paintings trade for up to 1.2 million on the primary market. She laments the fact that certain collectors continue, in this period, to speculate over high-profile names like Bradley. When faced with an art market that demands security, how are the younger galleries able to exist? Alex Mor opened a gallery in Paris with Philippe Charpentier in 2010. They are exhibiting at Art Basel for the first time. Their speciality: political art. They are showing Lawrence Abu Hamdan who at 33 years old is featured in the collections at Moma, the Tate and the Centre Pompidou. 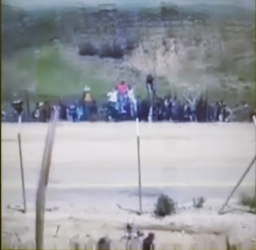 His video installation, on sale for 40,000 euros shows how on the border between Syria and Israel families communicate with each other by shouting across a valley in the Golan with a particular kind of acoustics. According to Alex Mor, paradoxically “it can be easier to sell an artwork for 1 million rather than 10,000 euros”. In his view the younger galleries must carve out their own path, which is often hazardous, from amid the proliferation of ultrapowerful multinational galleries. 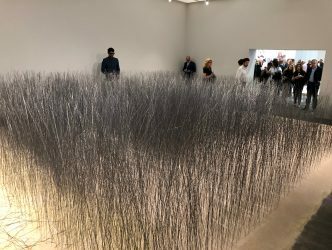 This year, as usual, the most astonishing place in Art Basel belongs to Art Unlimited, which is reserved for large-scale pieces. It’s at Art Unlimited that you can see an exceptional film by the American pioneering video artist Bruce Conner (1933-2008), rediscovered among others thanks to his retrospective at Moma in 2016. 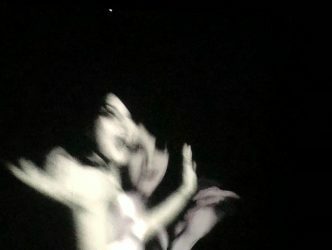 The 1966 artwork, 6 copies of which were recently released, consists of a series of syncopated images in black and white of a woman in motion with music in the background, presented by Paula Cooper for 275,000 dollars. It’s also here that Gavin Brown is showing a hypnotic video by the British artist Mark Leckey (born in 1966) with Pop perfect images in motion against a stark percussion soundtrack (250,000 dollars). 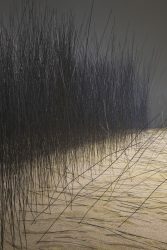 In the same hall the Pace Gallery is exhibiting a very poetic installation by the Korean artist Lee Ufan (born in 1936) composed of hundreds of iron rods planted in sand (850,000 dollars), evoking a seaside landscape or even the intimate part of a feminine landscape. 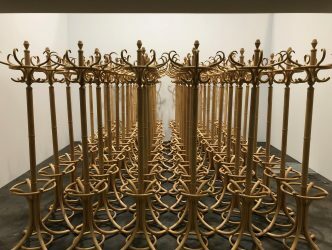 Then there is the unmissable work by French artist Arman (1928-2005), an Accumulation composed for the first time in 1959 of a series of 60 coat racks placed side by side to give the illusion that a mirror is being used to produce infinite reflections. Corice Arman, the artist’s wife, comments on this piece called “Fleur” (Flower). “Fleur” is presented by the Georges-Philippe & Nathalie Vallois gallery (a little under 500,000 euros). It is a good demonstration of the way in which artists who are now considered to be classic can have a contemporary resonance. Arman overproduced, which has certainly been damaging for his legacy, but he conceived certain types of works before everyone else. The market for contemporary art, which only a few years ago swore by the youth of its artists, now spends much of its time looking backwards. As though it were regaining its memory.